What can The Helpr do for me? How do I create Bubbles? Can I format the Bubble? Where do I find the embed code? Where should I paste the embed code on my website? Can I customize The Helpr Link on my website? Why can't I see the "Need help?" label on my website? The Helpr can explain your website* better by adding Bubbles with additional information. * for simplicity we write website but it could be a webservice or a complex formular etc. This code will embed a The Helpr Logo into your website that is clickable and will show all your created Bubbles drawed in their own layer above everything else. A Bubble points to an element on your website to show an explanation or additional information. A Document contains a random number of Bubbles. Drag this bookmarklet (The Helpr) to your browsers bookmark bar. Open your website in your browser. Click on the previously added bookmarklet, the Bubble editor will load. Click on "Create new Bubble" and select an element on your website to attach the Bubble. Save your Bubbles to a Document by clicking on "Save and Show" and login or create an account. Or login directly from the editor. In the future we will add full markdown support for the text, changing colors and font-size. Don't worry, every time you edit, delete or add a Bubble it does auto-save. Be aware that every change you do, will be published immediately. If you're logged in, go to the Document Overview, then click on any Link in the Column "Name". The next Screen shows all the details to your Document, click on "Show code". Be sure to paste the embed code directly before the closing </body> tag from your website. Can I customize The Helpr Logo on my website? 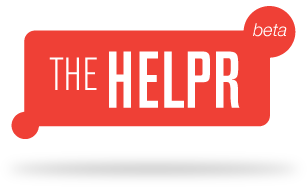 The "Need help?" label is on visible on pages of your website where you created Bubbles. For example: if you only created Bubbles on www.yourwebsite.com/about your user will see them while visiting the about page but not on the other pages like e.g. www.yourwebsite.com/service. The following browsers and platforms are tested regularly with The Helpr. If you see any problems, please report them.